Abdominal muscle strength and endurance is important for core stability and back support. This sit up test measures the strength and endurance of the abdominals and hip-flexor muscles. How many sit-ups can you do in 1 minute? Count how many you can do in one minute and then check the chart below for your rating. Starting Position: Lie on a carpeted or cushioned floor with your knees bent at approximately right angles, with feet flat on the ground. Your hands should be resting on your thighs. Technique: Squeeze your stomach, push your back flat and raise high enough for your hands to slide along your thighs to touch the tops of your knees. Don't pull with you neck or head and keep your lower back on the floor. Then return to the starting position. Compare your results to the table below. Remember, these scores are based on doing the tests as described, and may not be accurate if the test is modified at all. Don't worry too much about how you rate - just try and improve your own score. 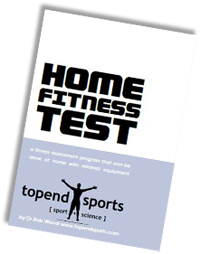 Download your free copy of the Home Fitness Testing Manual - a guide for you to plan, conduct, analyze and interpret fitness testing at home.